I really dig dresses! Basically they are the no fuss approach to dressing because there is no mixing and matching involved. You pretty much have a complete outfit on one hanger!! I know this is totally cheating fashion creativity but with my busy schedule (work, blog, wife, mom, maid, nagger, etc.) they have become the greatest invention ever! Also, during the warmer months I like to stay as cool as possible (I'm warm blooded by nature) by wearing light weight fabrics and dresses help accomplish that. Throw on some cute accessories and you are all set! Back when Lane Bryant was pretty much the only plus size clothing store, I used to shop there frequently but now that other companies and even some designer brands have hit the plus size scene, I rarely shop at LB. Why, you ask? Because I often feel like their items are too printed, too sparkly, too ruffled, too over priced...just too everything!! lol Also, I don't like the fact that I can see myself (someone else in my same outfit) pretty much everywhere I go! Having said that, I love the quality of LB's clothing (I still have items from 10 yrs. ago) so when I am near, I can't resist dropping in and doing what I call a "walk thru". It is during one of these random occassions that I sometimes stumble upon a fabulous piece that was totally worth the trip (like this dress)! Do you shop at LB? 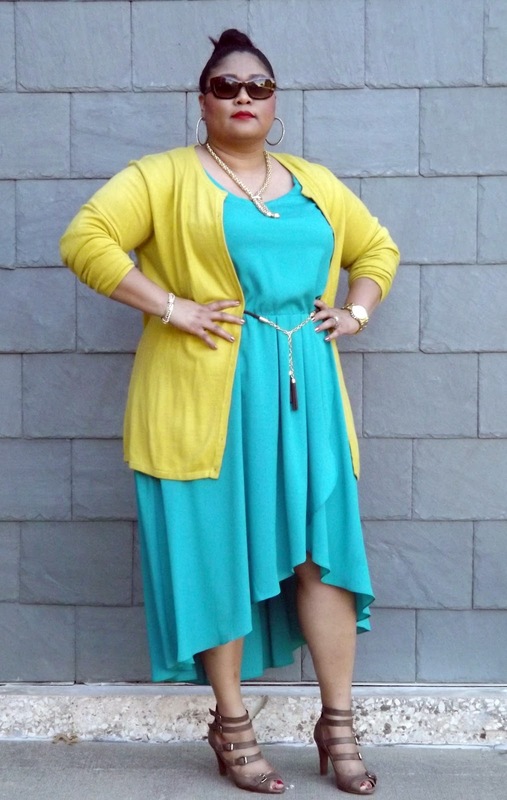 You have been rockin' some serious Lane Bryant lately! Dress is gorgeous!!! I have been on a hunt for the hi-lo hem and yet to find one. Still on a mission! Great colors, Kiah. Love it! I love the shape, shorter in the front, longer behind. the match of the two colours is perfection!! What a wonderful dress, and perfect lash, ahhhhhhhhhhhhhh, Kiah you are divine. I love the cut of this dress. It looks amazing on you. Dresses are a go-to for me too, espesh in the summer. How pretty is that dress. Perfect for a day at the beach too. Love the dress! I too have stopped shopping at LB now that I have options. I just don't find their clothes appealing anymore. But I will say that dress is fab on you! I love anything yellow so tha sweater is perfect with your dress!!! Love the colors! 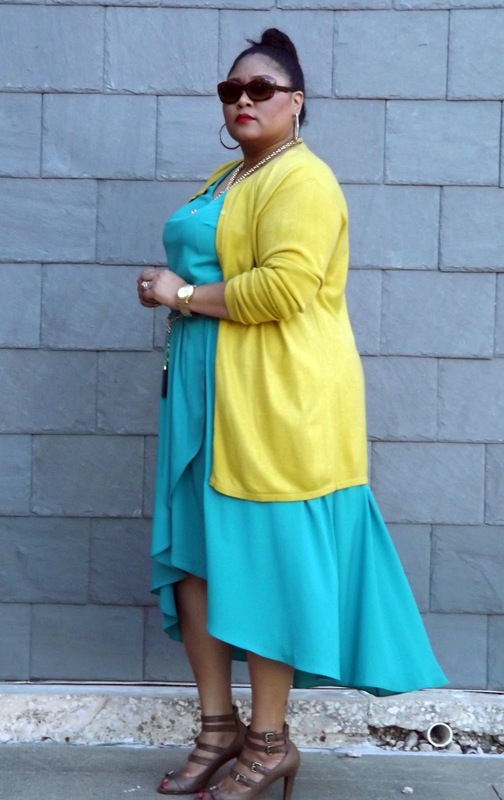 Very vibrant and although the cardy is old, the color is just so this season. You look great! Great dress, i like the colors very much! You look fabulous, Kiah. Really like the color combination. And lovely LB dress, too. Wow. I mostly shop at LB for my lingerie/intimates. Oh, and shoes! Their clothes are just overly overpriced. smh. I love this dress, i like LB also, i agree to expensive. But sometimes they have good clearance items. These colors look great on you, girl! Love the brights. Looking great! Love the color of this dress on you. I am back again to tell you to check on my latest post about a curvy model casting, I need your comment! Pretty dress! I love the color!! I used to shop at LB. I haven't shopped with them in a long time though. It just doesn't feel like they're on point with certain looks that I'm trying to accomplish, and YES they are overpriced. Now that their are so many other great places to shop (online and in the mall), LB needs to step up their game to earn my business back. I too L*VE dresses...Lovely combo! Gorgeous color combo!!! Your dress is superb Sunnies are one thing I can't seem to do with out either. I love dresses but not as much as I LOVE skirts... But the simplicity & detail of the perfect dress cannot be beat by anything(including skirts=). Love this dress!!! You getting Ms. Lady!!! I had the exact same dress in black, but I ended up returning it because my belt broke on me the day after I purchased it:<(....I was so upset! But hey, you killin'em! Agree on the too sparkly, too ruffled and too blinged out. Simpler is better. That being said-my fashion loving sisters-Talbots.com 90% off! Bought $1300 worth of clothes for $150!!! RUN, do not walk to your computer!!! I love that outfit on you. I usually shop at LB, because there are basically 3 plus size clothing stores in Staten Island: Lane Bryant in the Mall, Avenue, and Catherine's, and the Catherine's store is going out of business. I love dresses, too. This past summer I bought 2 great sundresses in Avenue, one in brown and one in turquoise, and they helped me get through the hottest days of summer. The only thing I don't like about wearing dresses is that I have to wear shapewear in the form of the high-waisted hip and thigh shaper from Spanx, or Junonia's boxers for women, and I have to shave my legs. I know, for some people it's not a big deal, but what can I say, I have issues! Pretty dress! I'm in love with high/low hems! Your color combo is great!!! LOVE the high low and the colors are fantastic! i used to shop at LB but like you, their prices are too much these days. alot of stores are, which is why i am in love with thrifting so much, LOL! Love the dress and the color combo! Love the hemline on this dress. And the colors are gorg! 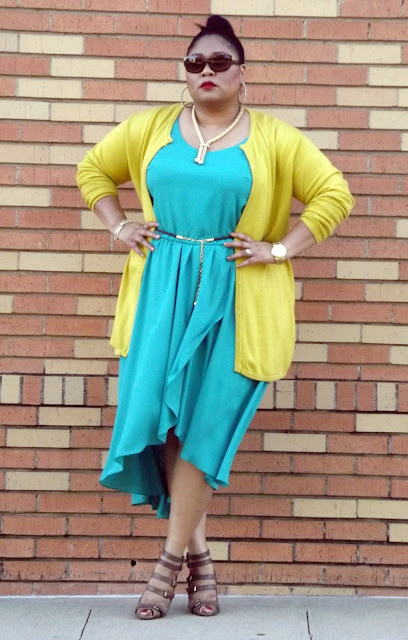 Love that dress....the color combo...that necklace is gorge! 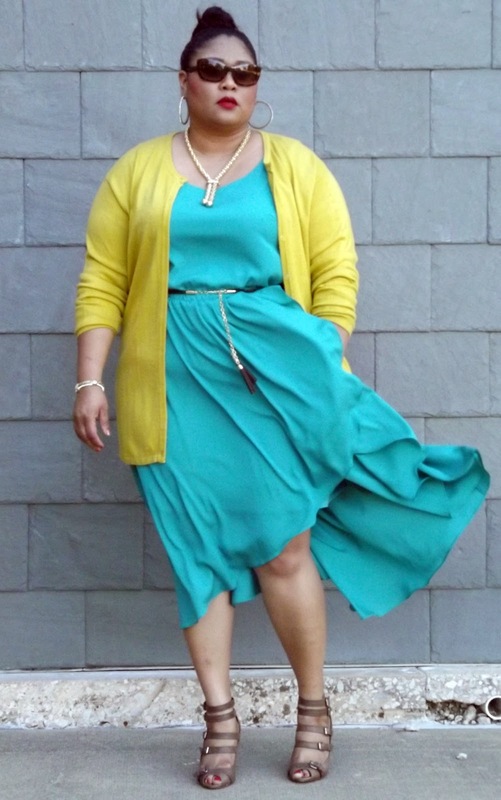 Love this dress, it has a great cut and love the color of the cardigan you paired it with. 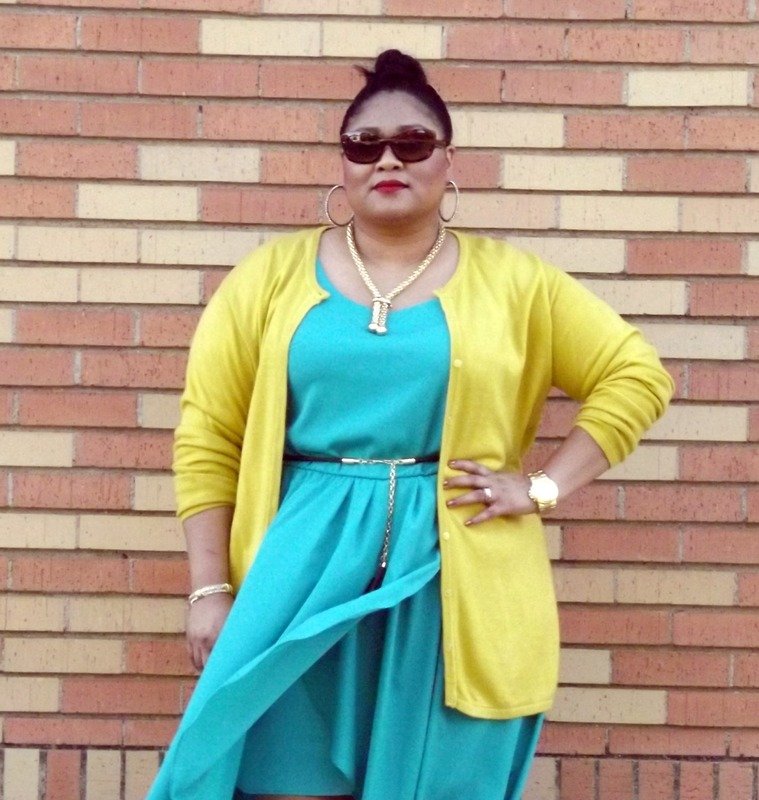 Is this a take on color-blocking? If so, you nailed it. 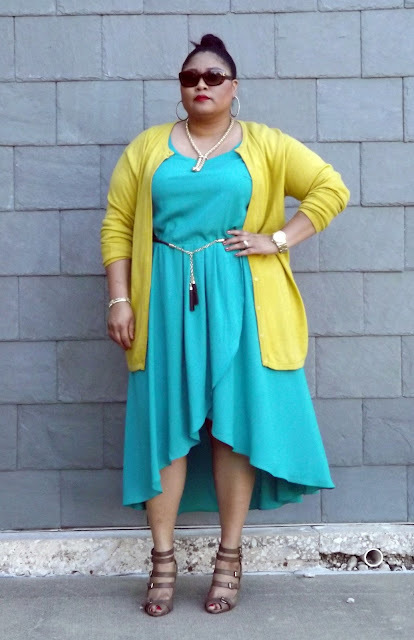 A lot of women (myself included) would be quick to throw on just a plain black cardigan but you took this outfit up a notch by pairing it with a light neon green-ish cardigan. I'm for dresses for the same reason you stated: no need to really coordinate things. Plus I just feel great when I'm wearing a dress. this color combination makes me cry for the sheer fact that its only ever going to get to a high of 13 here in Canada from a low of 3 degrees! PS Enter my <a href="http://truequeen.com/2012/04/16/review-giveaway-skinn-lip-tint-shine-duo/SKINN</a> cosmetics giveaway giveaway! I was digging in my closet the other day and started layering some of my maxis and thought, "This is a Kiah outfit!" I'll make sure to give credit where credit is due when I wear and feature them on my blog. Gorgeous outfit! Im loving these hi-lo dresses! Because you sure know what you are doing Ky..
Lane Bryant was not my favorite place back in the day. I need to check them out for often though because i be seeing alot of cute looks from them!!! How do u feel about the new blogger ky?? Girl, I feel the same way. I have jeans from them and that's about it! Torrid has the same issues as well. But you look pretty! LOVE the colour combination here! Beautiful as per usual.